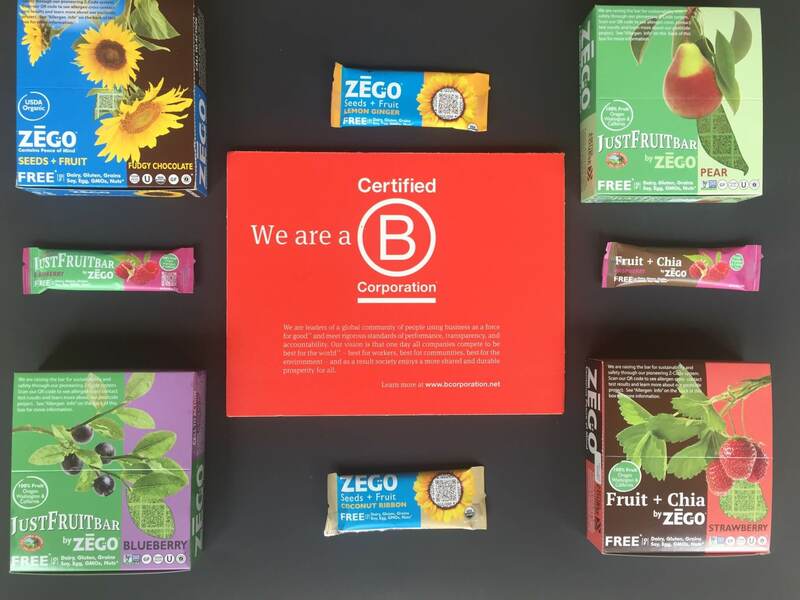 We have big news to announce – ZEGO is now a B Corporation! I love talking about our company because ZEGO is so much more than delicious, Free From snacks. But it’s hard to convey all we hold dear in a Tweet or Instagram post. If you had the time, I would want to tell you we are a family-based business that grew out of a desire to provide delicious and nutritious snacks that are safe for nearly everyone to eat–no matter your dietary restriction, that we are passionate about providing food safety data through dynamic labeling, and how we use our labels to communicate food safety information to you. I would tell you we believe you have a right to know what is in your food and encourage you to demand it from all the companies you buy from – especially when it comes to toxins like glyphosate or cross contact with allergens. I would want you to know that we are about more than transparency, nutrition and taste. I would want you to know that we work hard to support U.S. farmers by buying locally and regionally grown food for our products. We use our packaging to inform consumers how they can advocate for a cleaner food supply, and that we donate 2% of our revenue to improve nutrition for low-income kids. As you see, it takes us awhile to tell people about all we do, which is why we are so happy to be officially certified as a B Corporation! What is a B Corporation anyway? B Corp for business is similar to Fair Trade or USDA Organic for food, but much broader. It covers how you treat your employees, your corporate governance, and your commitment to protecting the environment and giving back to your community. Because not every question on the assessment is relevant to every type of company, to get certified you must score 80 points out of 200. ZEGO scored a full 113! Being B Corp certified allows us to use one symbol, the B badge, to show that we care about a lot more than profit. It means that we strive to make our business a force for good in our community and in our world. Why Did We Get B Corporation Certified? We didn’t get certified as a marketing tool. We got certified as a B Corporation because it’s not enough for ZEGO to be an independent “good guy” company. To be a force for good, we need to join forces with other B Corp food companies to define new, higher standards both in food labeling and food / social responsibility. By working together, we can encourage other food companies to follow the same path. The benefits will be felt for generations. It is part of our bigger commitment to always improving and setting the standard for transparency for food companies! What Does Our Being a B Corporation Mean to You? We have been doing the things that B Corp certified us for since we started ZEGO back in 2013, but it does make a difference to be certified. The certification actually holds legal weight as it is woven into your corporate legal structure. Most importantly, because re-certification is required every two years, you can be confident that as we grow, we will hold true to our values. So, here is our call to action for you — It truly matters if you support companies that are making a difference by how they do business. It’s simple, we can’t be a force for good if we don’t have enough sales! So when you are choosing which product to buy, look for the B Corp logo, help us spread the word about ZEGO and other B Corp companies, and ask other companies that you love to consider getting certified! Most of all, thank you for your support.